"Dance with the movement that your manifestation has created for you." "The artist as the sole creator motivated by a desire for self-expression." Maricel Sison is a self-taught photographer based in Los Angeles, California. Explore the city and her subjects in this day in the life snapshot. Be careful where you step. Everything here is important. Jewelry is the artistic sublimation of a natural human urge. "The enjoyment of beauty produces a particular, mildly intoxicating kind of sensation. There is no very evident use in beauty: the necessity of it for cultural purposes is not apparent, and yet civilization could not do without it. The science of aesthetics investigates the conditions in which things are regarded as beautiful; it can give no explanation of the nature or origin of beauty; as usual, its lack of results is concealed under a flood of resounding and meaningless words. Unfortunately, psychoanalysis, too, has less to say about beauty than about most things. Its derivation from the realms of sexual sensation is all that seems certain; love of beauty is a perfect example of a feeling with an inhibited aim. Beauty and attraction are first of all the attributes of a sexual object." That is what Sigmund Freud wrote in his essay "Civilization and Its Discontents." And his words serve very well as an introduction to the question as to why we wear jewels. In fact, beauty and sexual attraction are two of the attributes man seeks to attain by self-adornment. But if jewelry is worn primarily for the sake of beauty and sexual attraction, we shall see in the course of our investigation that there are other factors in our relationship with jewelry. In fact, jewelry must always be considered as closely related to the wearer; like clothing, it is only that relationship that brings it to life. In nature, beauty and the sexual instinct go hand in hand as a matter of course; in human society jewelry is their point of coincidence. Jewelry is the artistic sublimation of a natural human urge. This concept is amply confirmed by examples provided by the history of civilization, literature, and tradition. Press play to view Official International Trailer. Meeting Pina was like finding a language finally. and then she suddenly gave me a way to express myself - a vocabulary. When I began I was pretty shy. I still am. "You just have to get crazier." And that was the only comment in almost 20 years. That's how we became the paint, to color her images. For example, she'd ask for "the moon"? So that she could see and feel it. But that was all she said. nor whether you were on the right track. Pina was a radical explorer. She looked deep into our souls. What are we longing for? Where does all this yearning come from? "I believe that in the future, people will start painting pictures in one single color, and nothing else but color." The French artist Yves Klein made this remark in 1954, before embarking on a "monochrome" period in which each work was composed from just a single glorious hue. This adventure culminated in Klein's collaboration with Paris paint retailer Édouard Adam in 1955 to make a new blue paint of unnerving vibrancy. In 1957 Klein launched his manifesto with an exhibition, "Proclamation of the Blue Epoch," that contained eleven paintings in his new blue. By saying that Yves Klein's monochromatic art was the offspring of chemical technology, I mean something more than that his paint was a modern chemical product. The very concept of this art was technologically inspired. Klein did not just want to show us pure color; he wanted to display the glory of new color, to revel in its materiality. His striking oranges and yellows are synthetic colors, inventions of the twentieth century. Klein's blue was ultramarine, but not the natural, mineral-based ultramarine of the Middle Ages: it was a product of the chemical industry, and Klein and Adam experimented for a year to turn it into a paint with the mesmerizing quality the artist was seeking. By patenting this new color, Klein was not simply protecting his commercial interests but also hallmarking the authenticity of a creative idea. One could say that the patent was part of his art. The Impressionists and their descendants - van Gogh, Matisse, Gauguin, Kandinsky - explored the new chromatic dimensions opened up by chemistry with a vitality that has arguably not been equaled since. Their audiences were shocked not only by the breaking of the rules - the deviation from "naturalistic" coloration - but by the sight of colors never before seen on canvas: glowing oranges, velvety purples, vibrant new greens. Van Gogh dispatched his brother to acquire some of the brightest, most striking of the new pigments available and wrought them into disturbing compositions whose strident tones are almost painful to behold. Many people were dumbfounded or outraged by this new visual language: the conservative French painter Jean-Georges Vibert rebuked the Impressionists for painting "only with intense colors." It was a complaint that echoes back through the ages, to be heard whenever chemistry (or foreign trade, which also broadens a culture's repertoire of materials) has made new or superior colors available to painters. When Titan, Henry James's "prince of colorists," took advantage of having the first pick of the pigments brought to the thriving ports of Venice to cover his canvases with sumptuous reds, blues, pinks, and violets, Michelangelo remarked sniffily that it was a pity the Venetians were not taught to draw better. Pliny bemoaned the influx of bright new pigments from the East to corrupt the austere coloring scheme that Rome inherited from classical Greece: "Now India contributed the ooze of her rivers and the blood of dragons and of elephants." That the invention and availability of new chemical pigments influenced the use of color in art is indisputable. As art historian Ernst Gombrich says, the artist "cannot transcribe what he sees; he can only translate it into the terms of his medium. He, too, is strictly tied to the range of tones which his medium will yield." Ironically, people who write on art frequently overlook the practical side of their craft, often concentrating solely on stylistic, literary or formal qualities in their discussion of painting. As a result, unnecessary errors and misunderstandings have grown up in art history, only to be reiterated by succeeding generations of writers. Any work of art is determined first and foremost by the materials available to the artist, and by the artist's ability to manipulate those materials. Thus only when the limitations imposed by artists' materials and social conditions are taken fully into account can aesthetic preoccupations, and the place of art in history, be adequately understood. The most important concept found in the tantras is the necessity of unifying (ceasing to separate) apparent opposites in order to attain enlightenment. These opposites are usually represented as male energy (Shiva) and female energy (Shakti) or as the individual (purusha) and nature (prakriti). Thus the equality, or complementarity, of male and female is a foremost aspect of tantric practice, as the union of both is required in order to achieve the highest understanding. According to the tantras, male and female (or the individual and nature) are not really separate, but are only seen that way from the viewpoint of worldly phenomena. When one has achieved a state of perfect enlightenment the two will be seen as completely integrated. In fact the equilibrium of the two is considered to be the very nature of truth. As ancient as the moon itself, Moonstone holds the power of mystery. Its secrets are locked beneath a pearly veil, and with them, our own hidden truths. Only within its reflected light can we begin to understand what it has to teach us. Moonstone is foremost a talisman of the inward journey, taking one deep into the self to retrieve what is missing, the parts of the soul left behind or forgotten, then brought to light. Since earliest times, Moonstone has been a tangible connection to the magic of the moon - an amulet of protection for travelers, a gift of lovers for passion, a channel for prophecy, and a path to wisdom. Our ties to the moon are strong. As it waxes and wanes in cyclic perfection, it creates the tides and rhythms of our mother, Earth, and influences our behaviors, emotions and spiritual growth. Moonstone calms and encourages, teaching us the natural rhythms of life. The artist must be a philosopher, a psychologist, a student through his entire life. The search for knowledge, not only of one's craft but of one's self and the world around, is necessary to his growth and to the maturity of his art. Emil Bisttram, Oversoul, c. 1941, oil on masonite, 36" x 27"
Emil Bisttram, Cosmic Egg Series no. 1 (Creative Forces) , c. 1936, oil on canvas, 36" x 27"
Bisttram considered this one of his most important works. Emil Bisttram’s artistic career is of special interest because of the fascinating array of spiritual, philosophical, and scientific traditions he brought to bear on his painting. Profoundly spiritual and convinced that all intellectual disciplines lead to divine truth, Bisttram enriched his compositions with references to such varied subjects as electricity, rebirth, the growth of plants, the healing power of the dance, planetary forces, the fourth dimension, and the male and female principles of nature. Bisttram’s essential goal in building his compositions, however, was personal redemption. For Bisttram, dividing space on a blank sheet of paper replicated such proportional divisions as were made by the Creator when He separated day from night, and earth from water. Bisttram’s essential belief was that harmony was proportional, and that making harmonious, proportional divisions on a sheet of paper was a productive, life-giving, redemptive enterprise that combated negativity and disharmony. The manner that Bisttram used to proportionally divide his compositions was dynamic symmetry, a method of picture composition based on Euclidean geometry developed by Jay Hambidge (1867-1924). Bisttram used dynamic symmetry for the structure of his representational, abstract (cubist and futurist), and transcendental (non-objective) compositions. For Bisttram, dynamic symmetry functioned as a compass that guided him through the many stylistic experiments he undertook, and provides the essential coherency for his work as a whole. "As "civilized societies" come to depend more and more upon standardized mass-produced artifacts, the distinctiveness of classes, families, and individuals disappears, and the importation of foreign exotic arts increases to meet the demand for distinctiveness, especially for the snob or status market. One gains prestige by association with these objects, whether they are souvenirs or expensive imports; there is a cachet connected with international travel, exploration, multiculturalism, etc. that these arts symbolize; at the same time, there is the nostalgic input of the handmade in a "plastic world," a syndrome best described in Edmund Carpenter's "Do You Have the Same Thing in Green? or Eskimos in New Guinea" (1971). But for many items of commercial art, this very demand often leads to a proliferation and a mass production that vitiates the prestige and usefulness in the very snob market for which the new arts were invented - thus, "success breeds failure" is a new version of the adage "familiarity breeds contempt."" Click to read more online. "The siting of jewellery can also act to divide the body into zones, in addition to any capacity it has for expanding the associations of particular organs. The neck, for instance, is often an area of special attention. The massing of jewellery round the neck effects a striking visual - and thus, arguably, conceptual - separation of the head from the body. This is especially notable amongst some of the pastoralist peoples of East Africa, peoples such as the Maasai, Samburu, Turkana or Karimajong. Here it is often the practice for women to adorn the neck with beads sometimes numbering up to sixty and more strings and cover the whole area from the chin down to and over the top of the shoulders. The head, too, is often ornamented in some way, and armlets are common. The effect of numerous colourful strings of beads massed in the area of the neck is, however, visually dominant." "The beads of which such strings are composed are imported and have long been extensively traded throughout Eastern Africa. To that extent, as with so many traditions, adornment is often said to represent an investment in movable wealth. For men their herds of cattle and goats represent the sum of their worldly standing; for women it is bead necklaces, which are not put on for particular events but worn more or less all the time by those entitled to decorate in that manner." "No doubt it could be argued that the neck is the only place on the body for such bead necklaces to be conveniently carried, and in such societies, following a semi-nomadic or transhumant life, portability is of crucial importance. Yet beyond this practical consideration it is notable that many related people in this region make some distinction between the head and the heart. As elsewhere, the head is seen as the seat of the intellect, the heart of the emotions and metaphorically associated with many other essentially moral conditions. Reference to the heart expresses intentions, states of doubt or uncertainty, fear, envy, contentment, and so forth. It is interesting therefore that it should be the neck, a neutral zone, which is often elaborately adorned. The result is not to highlight it as of special significance in its own right, as has been the case in the other examples. At another level it acts rather to underline the distinctiveness of the associations of the head above the neck and of the heart beneath." Turkana old woman with labret, Kenya. 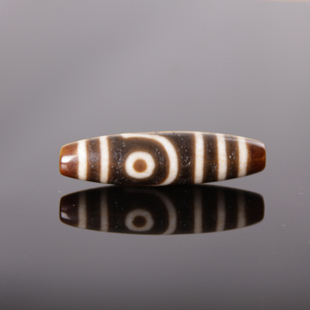 The unique dZi beads, a black-and-white (or dark brown) bead of "etched" or treated agate, is revered in Tibet. To Tibetans and other Himalayan peoples, the dZi is a "precious jewel of supernatural origin" with great power to protect its wearer from disaster. Since knowledge of the bead is derived from oral traditions, few beads have provoked more controversy concerning their source, method of manufacture, and even precise definition. In ancient times, it is said dZi adorned the gods, who discarded them when they became blemished, thus explaining why they are seldom found in perfect condition.